RICK CHEATHAM leads the US Sales Practice for BTS. He works with clients such as Google, Accenture, Metlife, and IBM to drive their sales efforts into the future. Rick leads a team of over 20 consultants and conceptualizes many of the BTS solutions deployed in the US. He is passionate about making work a place where salespeople come to be successful, is totally pragmatic and experienced in getting results through being a purpose-driven leader, and has an uncommon balance between vision and how things really get done. 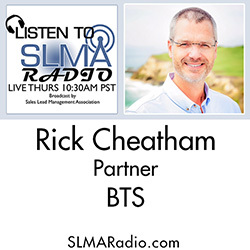 Prior to BTS Rick was a sales leader for both regional and global account teams. Ultimately he led the sales force of a $1B business unit through a restructuring and shift in how they sold, which has shaped his thinking on how organizations can change what and how they sell faster and more effectively. Rick lives in Austin, TX. BTS is a professional services firm nestled between consulting and training on the strategy execution spectrum. Our focus is on the people side of strategy working with leaders at all levels to help them make better decisions, convert those decisions to actions and deliver results. Rick leads BTS’ Sales Practice, which offers buyer-centric consulting, sales transformation (planning, change management, and training), assessment and selection, and on-the-job execution tools.